Well, is it pageant season or what? I'm not sure there even is such a thing. Certainly pageants have been in the news with the big Miss CA controversy that never dies. The allure of pageants died for me long ago. And this blog is about books, not looks. 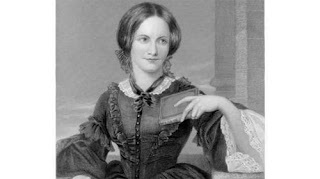 Still, I spied a picture of Charlotte Bronte today and thought to myself, What a looker! So, I thought I'd open the topic of literary lookers. Reader, I'm asking your opinion: Which writer was to-die-for great looking in addition to talented with pen or quill. My nominations go to the aforementioned Charlotte Bronte and to a gentleman who's not my favorite author, but whom I always thought of as quite something in the beauty department: Nathaniel Hawthorne. Hot on the heels of reviewing Allie Finkle's Rules for Girls, Moving Day, I had to read a Meg Cabot bio. And, since the only biography that seems to have been written is, understandably, geared toward children, it was that one I borrowed from the library. It's part of a series called, Who Wrote That? and the book is written by Camille-Yvette Welsch, an English teacher from Penn State, according to the back cover. It's not so simplified that an adult would find it frustrating, but it does do what children's biographies tend to do: make the subject into a paragon of, if not virtue, then role model-hood. But that's fine. Kids need role models and Cabot seems a fine one. The book is colorful, with many sidebars under the subtitle Did you know... and photos. This 136-page book is recent, with a copyright of 2008, so you don't feel like your reading one of those ancient dusty bios the neighborhood librarians just can seem to take off the shelves, or afford to replace. There are many other authors bios in the series, like Judy Blume, Beverley Cleary, E.B. White, L.M. Montgomery, C.S. Lewis, Charles Dickens and the list goes on for about two and a half columns of bold-faced type. It seems a happy thing to have happened upon this series, a good resource in research for kids and adults alike. Library book sale treasures and no buyer's remorse! The library book sale I went to today, in a neighboring town, was small with little selection, especially compared to the annual sale in my own town. But it was worth the lengthy and beautiful walk I had to make home. A lovely excursion on a Saturday morning: I knew I'd like poking around at old books, the older the better. Well, there were precious few really old books. And I thought the library was overpricing its wares at $1 a paperback and $2 for a hardcover. It used to be that you could get a book for fifty cents and it felt like a steal (a great feeling) and you were more likely to load up on them. But, perhaps, I'm being a Scrooge. In any case, I purchased two books, one old, one ancient-looking. I was prepared to pay the $4 for the two of them, but right when I got to the counter, the gentleman who had been doing the transactions was relieved for a break by a woman. Lucky me. Because she felt the books I'd selected were so out of shape that she seems to have made an executive decision and let me have them for half off. Happy thing for me! I sometimes feel foolish after I buy used books, deciding I don't want them after all and giving them away. I hate that wasted money feeling. I am quite sure, quite sure, that there is no monetary value to the books I purchased. Their value is entirely personal. One is is Louisa May Alcott from 1908 with some pretty frontispieces which I plan to make part of a LMA collection as Alcott things seem to turn up a lot of places; I already have two others. Thrifty book buyer that I have become, I thought hard and relatively long about whether I wanted these two. I couldn't let the Alcott go; I anticipated relative disappointment then. But, I realized as I pretended to browse the other books on the tables while I deliberated, if I'd found that the other book had gone missing there would have been near-visceral disappointment. What is this mystery book? I have to laugh and say it's really nothing special. IT terribly tattered, missing its back cover, looks like it fell in someone's bathtub a hundred years ago. It's like something pulled out of a traveler's trunk that's been rescued from a long-ago sunken sea-faring vehicle. But that's why I love it. It's as old as it looks. The copyright is 1859 with no later years listed. The first page is blank save for the inscription its owner made, presumably many years ago. The book appears to have been a text entitled A Greek Reader by Anthon and Jacobs. Its owner was Chas. L. Babson who wrote his school name below his, East Corinth Academy. Below that a Latin inscription and its English translation - Labor Omnia Vincit - Labour (British spelling) Conquers All Things. So, was he studious, this Charles L. Babson. Did he place the Latin quote in his Greek text to motivate himself? And where was East Corinth Academy? And could I find out anything more about him in the wired world of today? In times like these, Google is a friend, indeed. So, I found out that East Corinth Academy was located in East Corinth, Maine. Also, a Chas. L. Babson (that same spelling) was a town selectman in Brooklin, Maine circa 1864. I fancy he was in high school when he used the book and five years later, finished with school, became an involved member of the community. Of course, this brings up more questions. Can I find out more about him? Did he harbor grand ambitions as a antebellum young man? Had he dreamed of having Lincoln's job before Lincoln himself had it? The search will, when I'm bored and want to putter around the internet, continue. Would Chas. L. Babson ever have guessed that one hundred and fifty years after inscribing that book, his signature and text would be on display for anyone to see who happened upon a place called GBBS?